The bulldog of the heavy duty trucking industry, Mack has been a leader since it was founded in 1900, in Brooklyn, New York. They were the first to apply air cleaners and oil filters to their trucks, first with power brakes, first to use a drive shaft instead of a chain. Mack trucks have helped win wars, put out fires and they get work done every day. Born of the American spirit, the new Mack Anthem™ comes standard with a bold design built for your business that delivers serious aerodynamics, fuel efficiency and easy maintenance. Combined with a new highly comfortable interior designed for drivers to keep them comfortable, safe and ready to work. Mack Anthem’s instrument panel and steering wheel gives you total confidence and control in the cockpit. An easy, safe and comfortable environment to get the job done. Spacious cab and living space with premium materials and amenities. An increased 35% bigger space in the 70-inch StandUp Sleeper gives you plenty of room to rest well. Saves on fuel and reduces maintenance costs while maximizing uptime – and your bottom line. Mack Connect™ analytics and connective technologies increase uptime and help you to perform at your best. The HE+ Package combines and MP8HE engine and a host of aerodynamic and fuel features to minimize drag, maximize profit, and increase fuel efficiency. Drive a rugged truck you can rely on. Boost profits while tackling a wide range of applications in the truck series that excels at a host of configurations: dump, dump with lift axle, multi-axle dump, mixer, rear loader, roll-off, snowplow, twin steer mixer, tractor and tri-drive tractor. Precise engineering improves fuel economy to drive down the costs of doing business. Granite is flexible and can be spec’d for different applications to fit the way you work. Make every drop of fuel count with a purpose-built truck that promises to get the job done. Take on heavy loads, climb steep grades, and drive long hauls all while behind the wheel of a truck gives attention to your comfort, safety and style. With its Rawhide Edition interior, elevated seat position, and dominant chrome grill, the drivers of this truck aren’t just hauling heavy transport; they’re carrying pride. Tough and versatile beasts of burden that eliminate downtime while delivering comfort and functionality, the Terrapro series of trucks are built to handle whatever job comes their way. In touch stop-and-go driving their natural gas power and Mack®’s clean MP Diesel engines cut fuel costs without sacrificing power. The Terrapro Series gets concrete, municipal and front-loader jobs done with a superior level of productivity by being configurable to match the way you work: front loading for industrial use, side-loading for municipal use, rear-loading for commercial uses, stand-up driving for on-the-go jobs, and right-hand steering for curbside applications. 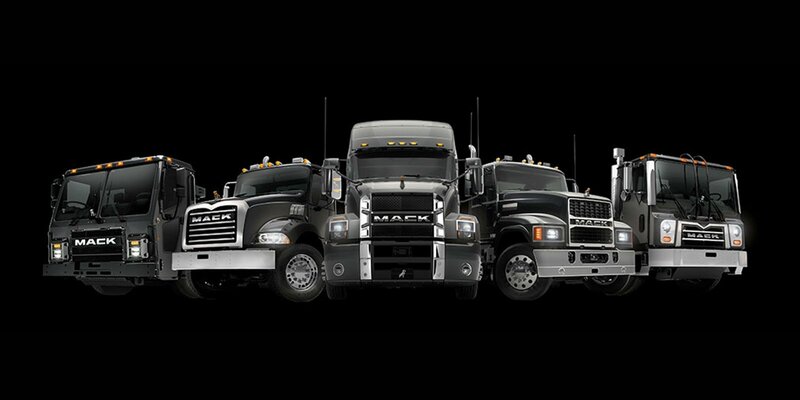 The Mack LR model is the newest truck to join Mack’s dominant lineup of refuse vehicles. Our LR model is powered by our MP Series engines to keep you moving. And with updates like storage, superior visibility and enhanced technology, every route is quicker, safer and easier. When you do the hard work, you need the truck that’s ready for any challenge.